I am writing this blog from the bridge of the FPV Pharos SG, which can only mean we have reached the end of another season at the South Georgia Museum. The five-day crossing back to the Falkland Islands has been a good opportunity to reflect on what we’ve been up to for the last month and a half. March was a month of departures and arrivals, as we said goodbye to our trusty Museum Assistants (MAs) and welcomed a visiting curator to the team. On March 15th we waved MA Sheri of in style as she left on the cruise ship Silver Explorer. We were sorry to see her go but know that she had a fantastic crossing to Cape Town, South Africa, stopping at very remote spots of Nightingale Island and Tristan da Cuhna on the way. Only a week later we were waving off the other MA, Rachel Morris. She was also off on an extended journey headed north, but this time of the spectacular tallship Bark Europa. This vessel visits the island every year and as usual offered the locals the opportunity of a short sail on board. At the crack of dawn on March 22nd a group of us hiked over to meet the vessel’s Zodiaks on the beach at Maiviken where they were dropping off passengers to do the hike the other way. Sailing along the coast of South Georgia in a ship like Bark Europa turned out to be quite an incredible experience. Unfortunately there wasn’t much wind (unusual for South Georgia) so we motored most of the way around, but they did let us have a go at unfurling the sails and, for the more adventurous amongst us, there was a chance to go clambering up the rigging. I was initially insistent that I would only go and watch other people doing this, but as I walked out onto the deck I was handed a harness and that was that! Climbing the rigging wasn’t actually as scary as I expected it to be, and the view from half-way up the main mast was amazing – so definitely worth it! Rachel will now be coming to the end of her trip on the vessel and I am certain she will have had a super trip – I can’t wait to hear all about it! The new arrival to the depleted museum team was Dag Børresen from Sandfjord Whaling Museum in Norway. Dag has spent many years studying whaling and his family used to work in the industry. As well as coming down to oversee how we run things at the South Georgia Museum, he also brought with him a new exhibition which we put up in our temporary display space in the main entrance to the museum. 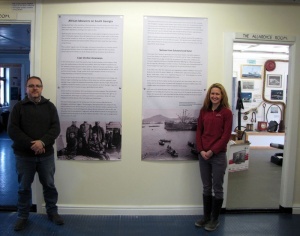 The exhibition is about African labourers who worked at the whaling stations on South Georgia as well as on the whaling vessels. It is a fascinating and little known story. Although rarely seen in photographs from the period, African labourers made up a sizeable percentage of the island’s workforce in the early years of whaling on the island, and the exhibition notes that they were often exploited and underpaid. The exhibition should be in place for the next year. On April 3rd we held ‘History Friday’. 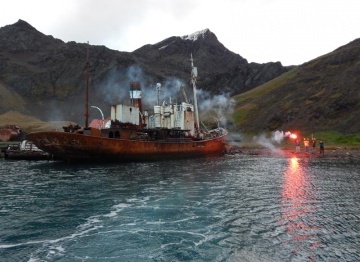 Locals were invited to come on the ‘Shackleton at Grytviken’ tour, a tour we are running this year and next to mark the centenary of the Endurance expedition. This was followed by a lively drinks party in a crowded staff room. Then that evening Dag showed a series of old photographs from his museum’s collection of whaling and whaling vessels in South Georgia. In the last few weeks we have been busy preparing the museum for our departure too. There was a lot of work to try to finish off, plus the end of season tasks like ordering lists, report writing and planning for next season. But the regular work also carried on with cruise ship visits, and we were able to achieve even more with the help of a regular volunteer – one of the SGHT Habitat Restoration (rat eradication) team’s chefs, Jerome. On the days he was not cooking or needed for other tasks with what we fondly know as the ‘rat team’, Jerome came to lend a hand with jobs including cataloguing and cleaning of artefacts. The rest of the rat team also dropped by for a special ‘Shackleton at Grytviken’ tour, in exchange for which they loaned us their muscle power and took down all of the outside signs and brought undercover for winter heavy items like the benches and picnic table. Eventually the winterisation process was complete and it was time for Sarah, Dag and I to catch “the Big Red Taxi” home, marking the end of another very busy and successful season at the museum. So as we swing across the ocean we want to say that we hope you have enjoyed reading this summer’s exploits. Be sure to check back in in November to meet next season’s team. This page was last modified 18:17, 3 May 2015. This page has been accessed 8,414 times.